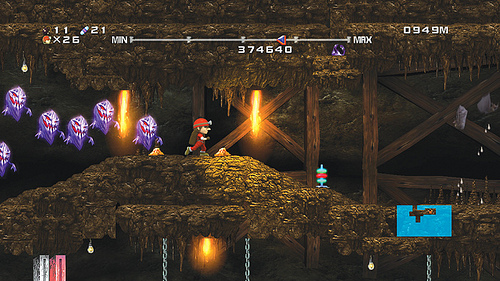 Our friends to the East have been enjoying the platform game, Spelunker HD for quite some time now. A remake of the original Spelunker for arcades and the NES, Spelunker HD has the same infectious music and punishing old-school difficulty you all know and love/hate from the mid 80's. The new version has ten areas with ten stages to an area, so that's like, a million levels. -I'm being told that it is actually 100 levels, which is a lot. Speaking of a lot, that's exactly the number of times you are going to die. A lot. You take your mighty spelunker, we'll call him 'Plunky,' down an elevator into a chasm of lethal perils. The e-mail from the game's PR firm actually taunted me with how difficult the game is. They think that having one of the most fragile heroes of all time is a selling point. And it is. This is one of those few games that achieves a satisfying mix of harsh difficulty with a sense of accomplishment as you complete each stage. This is coming from the people actually trying to sell the game. I appreciate their moxy. It would be easier to list what wouldn't kill you. Hmm. 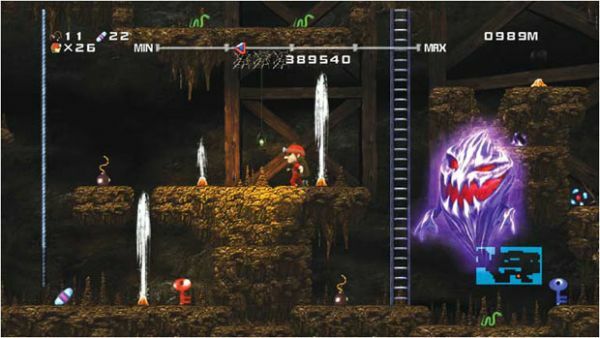 What won't kill you in Spelunker HD? Let's just stand here for a minute and- I'm dead. Yes, if you stand around, you run out of air, or the will to live, or something, and die. You can re-supply your will to live air by picking up multi-colored items found through out the level. There are also assorted gems and treasures to add to your score, which you can upload to the PlayStation Network. Take, for example, the picture above. Those anthill-looking lumps to either side of Plunky? No, they don't kill you. They simply throw you up and backwards if you fail to jump over them. Unless they are the kind of lumps that spray clouds of what I am assuming is weaponized arsenic into the air. That will kill you. So will the flames. And the ghosts. Did I forget to mention that there are ghosts? Yeah, there are ghosts. You can blow them away with your fan. Yep. You have a fan to protect you from the paranormal remnants of past spelunkers. All kidding aside, the gameplay is sharp and very responsive. Thankfully, the developers have added a 'rope assist' option that will keep you from prematurely hoping off of ladders or ropes, preventing you from falling to your inevitable doom. The difficulty only makes completing levels all the sweeter. Unfortunately, on top of all the challenging stages is a flawed save system. You see, you begin Spelunker HD with only five lives. If you lose all five before you get through and entire ten-stage area, it's game over, try again. I died five times on Stage One my first time through, so, yeah. To save the game you need to select "Save and Quit" from the pause screen. Then you can choose to continue from the title screen to get back in the action. Be warned: Only one save slot per user. If you do manage to clear a whole area, you can select the next area from the title screen. There's a way to game the system to get infinite lives, of sorts. I'm sure you savvy gamers out there can figure it out. Page created in 1.0314 seconds.